Docsvault is more than document management software as it comes with scanning management, workflow management, records retention and a plethora of other features. Docsvault Workflow automates and streamlines major business processes such as invoice approval, HR processes, legal and regulatory compliance, order processing, etc. and reduces delays and errors associated with circulating paper manually. Let us understand in detail how Docsvault’s workflow features can help any organization speed up their workflows while increasing accountability and transparency. Instead of paper pushing and carrying files around in a traditional work environment, you can complete tasks in a paperless and much easier way with Docsvault. You can initiate different workflows in one click (or automatically based on rules) with specific task instructions, add any number of participants and attach any number of supporting documents. 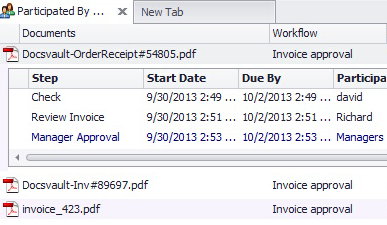 You can add due dates, that are dynamically calculated when the workflow is launched. Participants can delegate tasks to their peers or subordinates on demand if necessary. 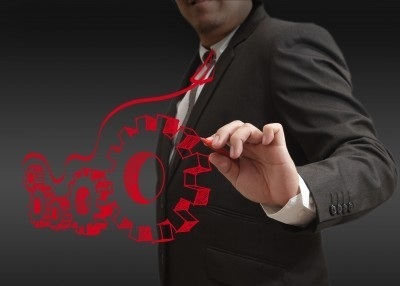 Unlike manual workflows, tasks can be routed automatically based on rules. Furthermore, electronic workflows ensure complete transparency, accountability and accuracy of workflow in any organization. the help of an auto transition condition. Let’s say for instance, any purchase order for procurement of raw material above $10k should be approved by concerned Head, CFO, Accounts Manager, etc. This transition can be as stringent or as flexible as you want by making approval by one, two or all mandatory. Docsvault saves you both time and money by automatically moving documents around the workplace for reviews and approvals. With the help of automated workflow, you can add actions and transitions that are triggered when a particular event occurs. This can be done with the help of transitions and index values. You can also set conditions to escalate a task, send overdue notifications or cancel workflow if the due date is not met. Docsvault offers simple and complex automated workflow, which means you have the flexibility to add as many or as few steps as you want. The best part about Docsvault document management software is it offers many crucial features that can help an organization improve their efficiency, cut costs and meet compliance regulations. If you have not yet tried Docsvault’s multi-faceted features, download our no-obligation 30-day FREE trial! So why wait, go ahead and try Docsvault, the modestly priced document management software with loads of smart features.